The J&K Fresh Team enjoyed another successful PMA with their customers! Atlanta — The Produce Marketing Association Fresh Summit exposition floor opened on Saturday, Oct 24 with 1,060 exhibitors occupying 267,400 net square feet. While the show room floor was packed with attendees, PMA said people took the conversation online with social media, and for the second consecutive year #FreshSummit was marked one of the most popular social media conversations around the world all day. 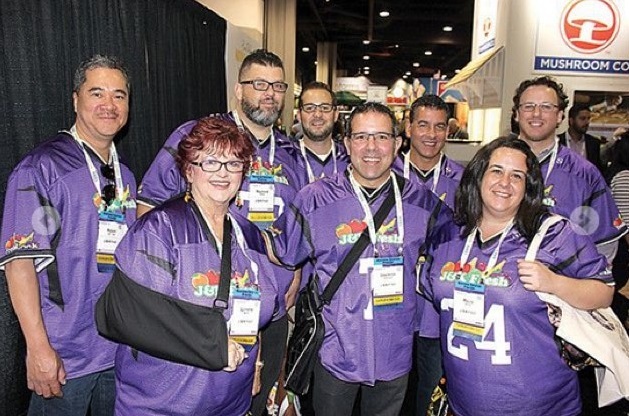 Walking the Fresh Summit floor representing J&K Fresh were Robert Lee-Hoy, Lynnette Keffer, Raymond Keffer, John Ercolani, Larry Antonucci, John Antonucci, Maura Miceli, and Evan Moss.